Soon after it was founded by Eugen Jochum in 1949, the Symphonieorchester des Bayerischen Rundfunks developed into an internationally renowned orchestra, its fame continuously expanded and fortified by its intensive touring activities. The orchestra owes its extraordinarily wide ranging repertoire and sound spectrum to the program preferences of its previous chief conductors as well as to the great flexibility and solid stylistic security of each individual musician. Fostering new music has an especially long tradition at the Symphonieorchester des Bayerischen Rundfunks with appearances in conjunction with the “musica viva” series, founded in 1945 by Karl Amadeus Hartmann, as one of the orchestra’s main assignments right from the start. At these concerts, Munich audiences have witnessed legendary performances of contemporary works at which the composers themselves generally stood on the podium of the orchestra. These included Igor Stravinsky, Darius Milhaud, Paul Hindemith, Pierre Boulez, as well as, more recently, Karlheinz Stockhausen, Mauricio Kagel, Luciano Berio and Peter Eötvös. Over the past few years, the Symphonieorchester has also pursued new approaches to early music and now collaborates regularly with such experts in historical performance practice as Thomas Hengelbrock, Nikolaus Harnoncourt and Ton Koopman. Many renowned guest conductors, such as Clemens Krauss, Erich and Carlos Kleiber, Charles Munch, Ferenc Fricsay, Otto Klemperer, Karl Böhm, Günter Wand, Sir Georg Solti, Carlo Maria Giulini, Kurt Sanderling and Wolfgang Sawallisch have left indelible imprints on the Symphonieorchester in the past. Today Bernard Haitink, Riccardo Muti, Esa-Pekka Salonen, FranzWelser-Möst, Daniel Harding and Andris Nelsons number amongst the significant partners who regularly mount the podium in Munich. The Symphonieorchester des Bayerischen Rundfunks was also the only German orchestra with which Leonard Bernstein regularly collaborated for many years. Besides the many performances and recordings in Munich and other cities in the station’s broadcast range, extensive concert tours are central components in the everyday life of the orchestra today. Tours have taken the orchestra to virtually every European country, to Asia as well as to North and South America. It makes regular appearances in New York’s Carnegie Hall and in the renowned concert halls in Japan’s musical capitals. 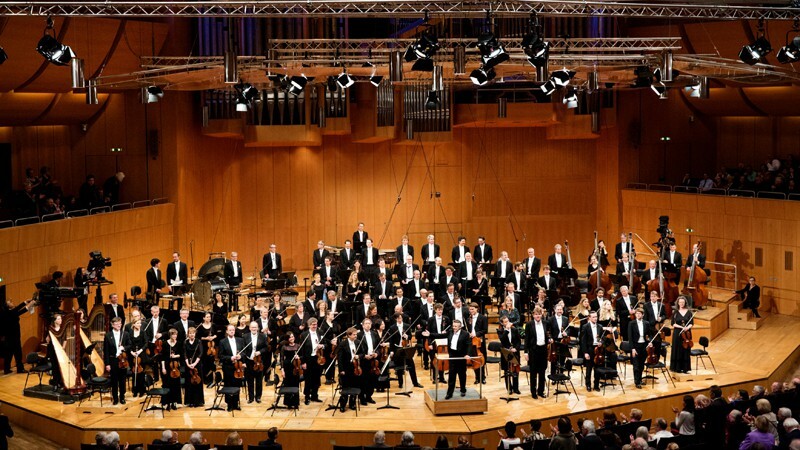 Since 2004, the Symphonieorchester under the direction of its current Chief Conductor, Mariss Jansons, is additionally the orchestra in residence at the Easter Festival in Lucerne. A further special feature is the encouragement of up-and-coming young musicians. In conjunction with the ARD International Music Competition, the Symphonieorchester accompanies young musicians both in the final rounds as well as in the symphonic closing concert featuring the prize winners. Since October of 2001 the Academy of the Symphonieorchester des Bayerischen Rundfunks has been doing valuable educational work by preparing young musicians for their later careers and thus building a solid bridge between education and professional activity. Beyond this, the Symphonieorchester maintains an encouragement program for young people with many activities designed toward the worthy goal of bringing the younger generation closer together with classical music. The history of the Symphonieorchester is closely intertwined with the names of its previous chief conductors, who were always concurrently Chief Conductors of the Chor des Bayerischen Rundfunks. The founder, Eugen Jochum, led the orchestra for eleven years (from 1949 to 1960.) He built up the orchestra completely with top-grade musicians and established it´s world-wide reputation on its initial foreign tours. Munich audiences have him to thank for incomparable interpretations of the symphonies of Anton Bruckner. Besides Bruckner Eugen Jochum devoted special attention to the performance of sacred music, and also made regular appearances on the podium of musica viva. Rafael Kubelík, who headed the orchestra for eighteen years (1961 to 1979), remained closely associated with the orchestra as a guest conductor beyond that period. He expanded the repertoire to include works by Slavic composers like Smetana, Janáček and Dvořák, as well as spearheading the cause of 20th century composers such as Karl Amadeus Hartmann and conducting the first Mahler cycle with a German orchestra, which was then recorded. His impulsive, emotional approach to music won the hearts of all the musicians and made the Kubelík era one of the most fruitful ones in the history of the ensemble. When his already designated successor Kyrill Kondrashin, unexpectedly died in Amsterdam, the orchestra turned to Sir Colin Davis, thus gaining a recognized Berlioz specialist as chief conductor (1983 to 1992), who likewise proved an excellent advocate for the Viennese Classical Era as well as the works of English composers, especially Edward Elgar, Michael Tippett and Ralph Vaughan Williams. From 1993 to 2002 Lorin Maazel led the Symphonieorchester. He set new styles of programming by performing cycles of symphonic works by Beethoven (1995 and 2000), Brahms (1998), Bruckner (1999) and Schubert (2001). He took his leave of his orchestra with a Mahler cycle in 2002. A new and mutually pleasurable chapter in the history of the Symphonieorchester began in October of 2003 when the acknowledged favorite candidate of all the musicians, Mariss Jansons, assumed his post as the new Chief Conductor of the Chor and the Symphonieorchester des Bayerischen Rundfunks. In no time, he succeeded in creating an atmosphere of the highest artistic standards and a close emotional tie with the orchestra. He regularly receives enthusiastic reviews both for his concerts and Munich and the many guest appearances in the leading musical capitals of Europe, America and Japan. Mariss Jansons conducts a wide repertoire, covering the classical and romantic eras and continuing on to 20th century music and works by contemporary composers. He regularly earns enthusiastic reviews for his concerts in Munich as well as the numerous guest appearances in virtually all the major European musical capitals. With a high number of CD releases, among others a series of live recordings of Munich concerts, Mariss Jansons continues to expand the orchestra’s vast discography. The recording of Shostakovich’s 13th Symphony won the Grammy for “Best Orchestral Performance” in 2006. Since September of 2009, the Symphonieorchester des Bayerischen Rundfunks has been releasing CD’s and DVD’s on Bavarian Broadcasting’s own label, BR-KLASSIK. In a number of different surveys of music critics, the Symphonieorchester des Bayerischen Rundfunks has numbered among the top ten orchestras in the world, most recently in the 2008 orchestra ranking by the British music magazine “Gramophone”, (6th place) and in the Japanese music magazine “Mostly Classic” in 2010 (4th place). The Symphonieorchester des Bayerischen Rundfunks got awarded the “Preis der Deutschen Schallplattenkritik” (Award of German Record’s Review) for Antonin Dvorak’s Symphony No. 9 conducted by Andris Nelsons. In February 2016, the production of the “Missa solemnis” by Ludwig van Beethoven under the direction of Bernard Haitinkder was nominated for the GRAMMY with choir and symphony orchestra of the Bayerischer Rundfunk. For the recording of the 3rd Symphony by Gustav Mahler under the direction of Bernard Haitink, the orchestra was awarded the BBC Music Award in April 2018. The recording of Bruckner’s Symphony No. 8, conducted by Mariss Jansons received the “Preis der Deutschen Schallplattenkritik” in 2018. Rachmaninoff’s “The Bells”, directed by Mariss Jansons, was awarded in April 2018 by the British “Gramophone Magazine” and the French magazine “Diapason d’Or”. The conductor and Bruckner-expert founded the Symphonieorchester in 1949. He was the chief conductor of the Symphonieorchester for 18 years and still conducted the BRSO as a guest until 1985. The “gentleman-conductor”: With the Symphonieorchester he worked on pieces by English composers such as Edward Elgar, Michael Tippett and Ralph Vaughan Williams. From his musicians he demanded highest technical precision and therewith brought the orchestra to a new level of musical perfection and brilliance. Mariss Jansons is one of the most celebrated conductors of our time. Since 2003 he has been Chief Conductor of the BRSO.